PVREA App | Poudre Valley REA, Inc. Manage your account, your way. 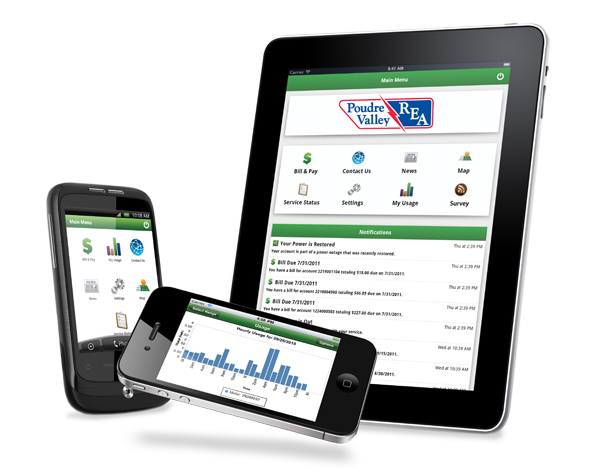 PVREA’s app allows you to manage your account from a computer, smartphone or tablet. Download the app to stay connected from your mobile devices. Available in the App Store and Google Play Store. set up outage alerts - new feature! Download PVREA's new app for a chance to win! PVREA's new app just launched, and to celebrate we're running a contest throughout 2019 for members who download the new app and enter to win! Click here for full contest details. How do I install PVREA's app on my iPhone or iPad? On your iPhone or iPad, simply click on the App Store and search for PVREA to download. How do I install PVREA's app on an Android device? On your smartphone, simply click on the Google Play Store and search for PVREA to download. How can I sign up on the web? Getting started is easy. If you don’t already have online access to your account, you can quickly sign up for it. All you need is your account number. Find more detailed instructions here. In your online account through the browser, under the My Profile tab, go to My Information. on the left hand side of the screen, navigate to "Update My Printed Bill Settings". On the right hand side, you can toggle your Printed Bill Status to "off". Help! I'm locked out of my account. Users are locked out of their online account after 6 unsuccessful attempts to log in. If you are locked out, you may have typed in the wrong password or wrong email address. To unlock your account, call into the office during office hours and a Member Service Representative can help you out. If you need to make a payment and are locked out of your account, you can pay online without logging in by clicking here. And remember, members can always make a secure payment over the phone by calling 1-800-432-1012. How do I view my Power Peak? In your online account, go to My Usage in the Nav bar. Select My Usage in the dropdown menu. Click on “Use the Usage Explorer tool” button. Change your “usage type” to kWh and Demand (kw). Power Peak and Demand are the same thing. Click here to learn more about your power peak. Click on "Manage Notifications" under the Notifications section. Click on the Service tab. Choose which cell phone and/or email address you would like to receive the notifications for all of the alert types. If you have no contacts listed, you can add contacts under Manage Contacts. Click on Notifications in the menu.